Completely modular, and infinitely customisable. Made right here in Christchurch. Our floor stock model is covered in hard-wearing neutral fabric. The seat cushions are high-resilient foam, and the back cushions are filled with a combination of feathers and pearl-ball. 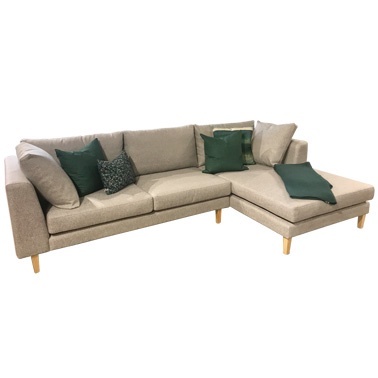 This model has a light coloured wooden tapered leg. Special size requirement? Ask us for a quote for any size, any configuration, and fabric, any leg colour.